Explanation: Named for a forgotten constellation, the Quadrantid Meteor Shower is an annual event for planet Earth's northern hemisphere skygazers It usually peaks briefly in the cold, early morning hours of January 4. The shower's radiant on the sky lies within the old, astronomically obsolete constellation Quadrans Muralis. That position is situated near the boundaries of the modern constellations Hercules, Bootes, and Draco. About 30 Quadrantid meteors can be counted in this skyscape composed of digital frames recorded in dark and moonless skies between 2:30am and local dawn. The shower's radiant is rising just to the right of the Canary Island of Tenerife's Teide volcano, and just below the familiar stars of the Big Dipper on the northern sky. A likely source of the dust stream that produces Quadrantid meteors was identified in 2003 as an asteroid. Look carefully and you can also spot a small, telltale greenish coma above the volcanic peak and near the top of the frame. That's the 2018 Christmas visitor to planet Earth's skies, Comet Wirtanen. It's the attack of the Quadrantids seedind Earth with probably dust and ice! 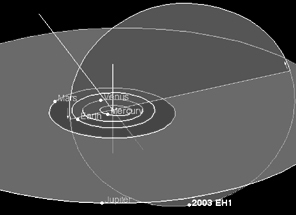 The orbit of 2003 EH1 is highly inclined at an angle of about 71 degrees and approaches the orbit of Jupiter at its furthest point from the Sun. <<On December 08, the International Astronomical Union has issued a telegram with the announcement that the parent body of the Quadrantid meteor shower has been discovered in an orbit among the meteoroids. Peter Jenniskens is quoted as saying "2003 EH_1 (cf. MPEC 2003-E27) would seem to be a very strong candidate for the parent of the Quadrantid meteoroid stream." This is our strongest meteor shower with Zenith Hourly Rates as high as 130 per hour. It is the only major shower without a parent body. In a paper submitted to The Astronomical Journal, Jenniskens explains how until this new discovery, the parent of the Quadrantid shower was thought to be lost from the stream. It was long known that the orbit of the Quadrantids evolves rapidly due to frequent close encounters with Jupiter. About 1,500-4,400 years ago, the orbit was only inclined by 13 degrees and the perihelion distance was only 0.10 AU. Now, the orbit is a steep 71 degrees and the perihelion distance has moved out to 0.78 AU. When comet 96P/Machholz 1 was discovered in 1985 in an intermediate orbit with a perihelion distance of q = 0.12 AU and an inclination of 60 degrees, it was long thought that this was the parent body. In a 1997 paper in Astronomy & Astrophysics, Jenniskens had predicted that such a body should exist, because photographic observations by members of the Dutch Meteor Society in 1995 had shown that the meteoroids move in nearly parallel paths moving to similar distances out into the solar system, to a point close to Jupiter's orbit. Each time when Jupiter approaches the stream, it will perturb some of the meteoroids, and as a result the shower disperses rapidly. The observed spread in orbital elements implied an age no older than about 500 years. Quadrantid's Raiders, far less deadly than Quantrell's Raiders. If the dusty tails of comets get blown away with the solar wind, how is it that the "dust" from these comets orbit long term? Shouldn't the debris left from comets (and asteroids) be called sand and pebbles? It doesn't get "blown away" in the short term. Depending on the dynamics, it simply gets sped up or slowed down a bit, resulting in it following a very slightly different orbit than the parent body. It takes a long time for that debris to end up in the Sun, though. Well, a long time from a human standpoint- thousands of years. But a short time in the big scheme of things. Meteor showers typically only persist a few thousand years, since the comet becomes dormant and the debris trail is fairly short lived. I was more thinking of the visible tail of a comet which gets blown away from the sun. So it was kind of a question of wording - dust vs sand. Even the visible tail isn't getting blown away as such, it's just getting pushed into a slightly different orbit, leading or lagging the parent body just inside or just outside the parent body orbital path.